Happy Tuesday, friends! Hope you’re having an awesome week! It’s definitely taken a turn towards Fall here in the East Coast and although I love me some summer, I’m totally embracing it. The other positive about it being a bit cooler? Workouts are still awesome outdoors & the humidity it basically gone. Can I get an AMEN!? My friends at Zappos & Merrell are sharing all things outdoors & challenging everyone to share their statement “I train so I can” to help inspire others to get outside & get moving! 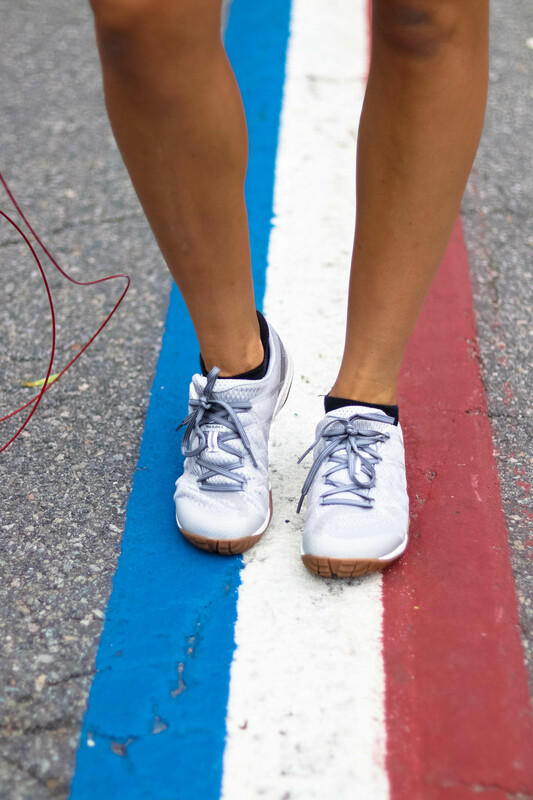 It’s super easy to get moving with Merrell’s Trail Glove 4 Shoes & Zappos promise – fast, free shipping, a 365-day return policy, and world class customer service. My shoes that I ordered got to me super quick & then I was out exploring! 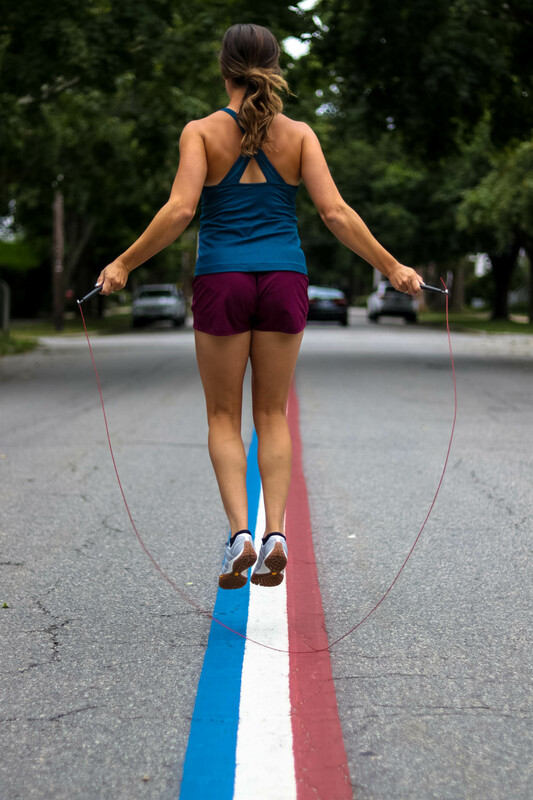 It doesn’t hurt that I live in the only town that has a Red, White, & Blue street line on the roads and couldn’t resist getting in some jumps right in the middle of the road. 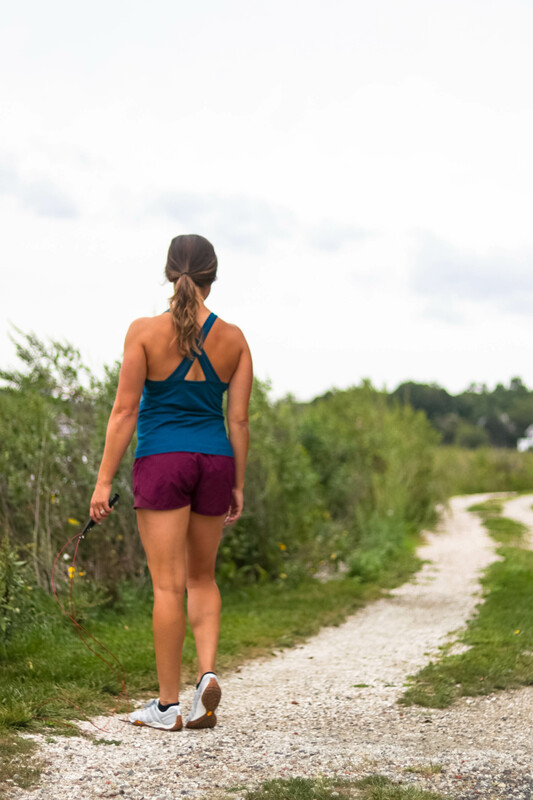 Merrell is the perfect partner to help you enjoy your time outside to the fullest and their shoes are comfy, durable, & come in a variety of colors. When I saw the title of the campaign, it took me a little while to think of how I wanted to finish that statement. It’s pretty empowering to really get deep on the purpose behind why you love to move & keep yourself healthy & strong. I train so I can….inspire others. I train so I can…be strong for myself. I train so I can…be strong for others. I train so I can…get the most out of life. I train so I can…be ready for anything life throws my way. I train so I can…help reduce my anxiety. If you take a look around your town, your workouts can be built around Nature’s challenges — how cool is that? Trail running on the rocks by the ocean or jumping rope in the middle of the woods? Heck yes! You can truly make it your OWN. As a Personal Trainer, these words hit home with me. I often remind my clients that training is SO much more than just what we look like or want to look it. There has to be a PURPOSE behind WHY we are choosing to be active, get outside, & train! I have clients that train with me so they can be stronger & healthier to ride bikes with their grand-kids on the bike path by the ocean waters. I have other clients who want to be a good role-model for their daughters and show them how to be STRONG. We want YOU to fill in the blank! Leave a comment below to finish the statement and tell us why you train. You never know who you will inspire or how EMPOWERED you will feel to put it out there. 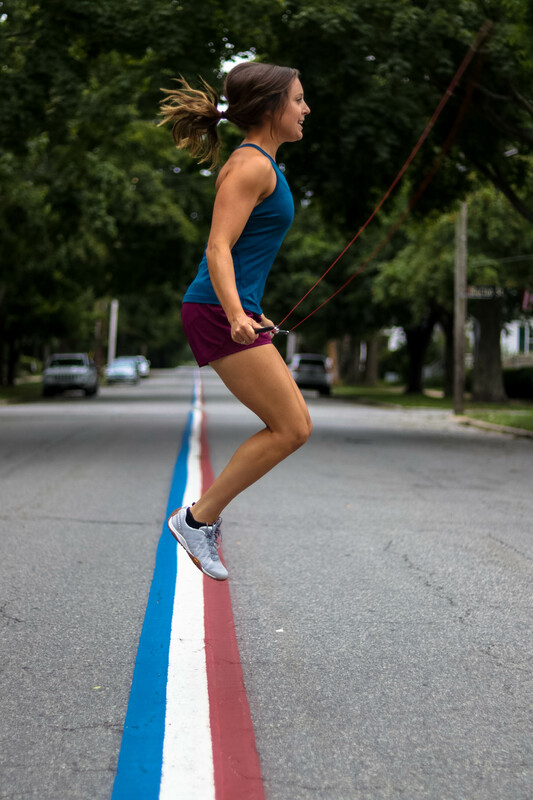 Fuel Your Better College Campaign - Meet Athlete Shannon Lee! I train so I can…have energy and be strong. Great article! I’ve been combining all the knowledge I got from this amazing blog with this product – https://bit.ly/2IrcYCR – and my weight loss plan is going fantastic! Thanks!!! I train … so I can. May be we add ” train, train, train and train”. I found on the web this : https://bit.ly/2C17duc, what doyou think about?